Phone speaker docks are something that have always intrigued me but I’ve never taken the plunge for one. The last time I went away with a group of friends (for a stag do), we stayed in a sparsely furnished country villa, and a friend brought his iPod dock which turned out to be one of the saviours of the weekend. Even though it was actually rather large. So if you’re thinking to yourself that you’ve got a nice Bose speaker dock at home (other brands are available), that is great for your house but too big to take away (or realistically too expensive/nice to carry) then this TDK Travel Speaker may be right up your street. Another real life experience here: when we got these in stock last week, I decided to test one as I was going away the following weekend to visit some family. It is, as you’d expect, a travel speaker that folds up nicely, clam-shell style. It’s about the size of an old VHS video cassette, so it’s not quite going to fit in your pocket unless you’re rocking the cargo pants look, but if you’re taking an overnight bag with you it can easily fit in the side pocket or just on top of your contents inside. I was really impressed with the sound quality and volume of the speaker with enough bass to not sound tinny and for the price, I honestly couldn’t fault it. I was able to play the Jake and The Neverland Pirates soundtrack for my 3 year old and let him jump all his energy out before tea time, and then after all the kids had gone to bed, I could break out the air guitar happily for a bit of AC/DC. 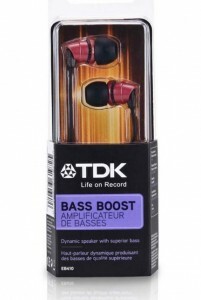 TDK is one of the classic music technology brands, and at £29.99, these speakers are pretty amazing quality, both for sound and build. The slight drawback is that the dock connector is only compatible with an iPhone 4 or below and iPods, (so not if you’ve got a Windows or Android phone you have to connect via the universal line-in jack. It works but doesn’t look so slick. Another small upside you get from this, when your device is docked it will charge it’s battery as well so a small upside there. These are a great addition for anyone who travels for work or goes away socially frequently or if you’re being super organised they’re a potential Christmas present for a teenage relative. 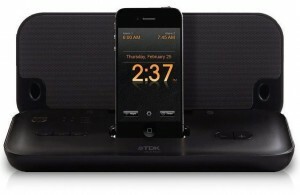 View the TDK Travel Speaker here.